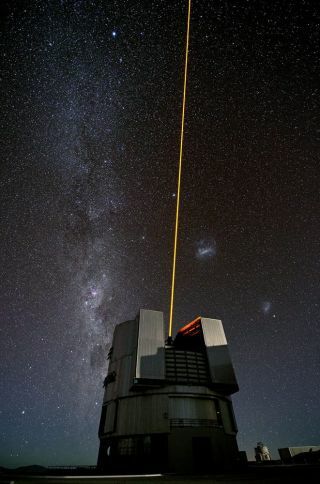 ESO’s Very Large Telescope (VLT) tested a new laser for the VLT on Feb. 14, 2013. To the right of the centre of the image, just below the Small Magellanic Cloud, streaks comet Lemmon. When it comes to detecting laser pulses aliens might shoot at Earth to attract our attention, scientists now find they can detect signals as faint as a single photon of light every few tiny fractions of a second. Astronomers have gazed at the skies for decades searching for signs of extraterrestrial intelligence. Lasers can in principle help transmit messages over extraordinary distances, but while scientists have monitored a large number of stars looking for alien laser signals — for instance, facilities at Harvard and Princeton scanned more than 10,000 sun-like stars for several years — no evidence for any have been found yet. "We assumed that aliens would use the simplest possible way of attracting our attention, one already implemented in seafaring since ancient times using lighthouses — that is, periodic light pulses," Leeb said. The kinds of strings of pulses the researchers are looking for, each roughly nanoseconds or billionths of a second long, are not likely found in nature. "Such signals can, however, be generated by lasers," Leeb said, thus hinting at an extraterrestrial intelligent origin. The advantage of a repetitious signal is that it can readily be distinguished from random noise, even if a large portion of transmitted pulses are lost before they are received. Leeb did note that astronomical objects known as pulsars also give off repetitive light pulses. "However, their signals have a rather low repetition frequency, and do not consist of nanosecond pulses an extraterrestrial intelligence will possibly use," he said. Since current technology on Earth is capable of powerful visible and near-infrared lasers, the scientists assumed extraterrestrials might be as well. They reasoned aliens would choose wavelengths that would stand out from the light from their home stars as well. Although Leeb and his colleagues assumed that aliens would use high-energy lasers to fire these pulses, they also reasoned the vast distances these signals traveled means these pulses might be very faint by the time they reached Earth. As such, their strategy employs devices known as single-photon detectors, which as their name implies can detect signals even as dim as a single photon, the particle making up light. In a lab test of their strategy, the researchers simulated an extraterrestrial laser signal with 10,000 near-infrared pulses per second from an exoplanet orbiting a sun-like star 500 light-years away. Assuming a receiver 5.5 feet (1.7 meters) wide and a transmitter about 33 feet (10 m) in diameter with a 42-kilojoule laser — one potentially technically within reach of modern technology — Leeb and his colleagues found their technique was capable of clearly detecting as little as one photon on average per pulse. Leeb hopes the simplicity of this method will spur other groups to use this method "when searching for signals sent by extraterrestrial intelligence. This will increase the chance to provide evidence that we are not alone." The researchers have already begun trying out their method on distant stars with the 80-centimeter telescope at the University of Vienna, targeting a number of recently detected alien planets that supposedly lie within the habitable zones of their host stars — the areas where that star's light makes temperatures just right for keeping oceans of liquid water on the surfaces of those planets. "Examples were Kepler-22b, HD 33564b, HD 87883b and the exoplanets of Gliese 581," Leeb said. They plan a more systematic survey as soon as they have improved the pointing and tracking accuracy of their telescope. Leeb cautioned, "We have yet not actually received the signals for which we have designed our method." "They show that current detector technology can detect individual photons and process their arrival times to sense the expected faint illumination from even a distant alien transmitter," said astronomer Geoffrey Marcy at the University of California, Berkeley, who did not take part in this study. "The key now is to implement their SETI technique on a large telescope having a mirror of diameter 1 to 3 meters (3 to 10 feet) to begin searching for periodic laser transmissions." Space instrumentation engineer Felix Hormuth at the Max Planck Institute for Astronomy in Heidelberg, Germany, who did not participate in this study, said this latest work showed "a very clear, sound, and technically proven way" to help discover alien signals, and was suitable "for deployment at many of the small- to mid-sized telescopes becoming less and less used in the times of extremely large telescopes. “It is not science fiction, but a reasonable approach with the right amount of boldness to be both fascinating and realistic," Hormuth said.